The ability to navigate accurately is the most important skill for anyone heading into the mountains. In the Rockies the weather and visibility can change rapidly, making it especially important for hikers and mountain users to be able to navigate effectively even in limited visibility. 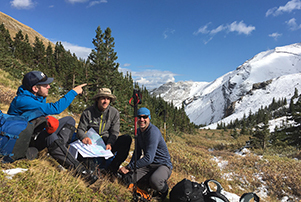 This basic 1-day mountain navigation skills course aims to give you an introduction to planning and navigating with the use of a map and compass. This course will provide you with the skills you require to navigate in both summer and winter, with no trails and in all weather conditions. We’ll provide you with enough information to keep it interesting but not too much where it becomes hard to remember. The course will have a classroom element in the morning followed by a practical session in the field in the afternoon. This course can also be taken along with the Navigation 2 (Digital trip planning and electronic navigation). We offer a 10% discount when you book both Navigation courses at the same time. Meet at the Yamnuska Mountain Adventures office at 8:00am. Coffee and tea will be available. There will be an short introduction, discussion of goals and objectives and then an explanation of hazards and risks. Meet at the Yamnuska Office (200-50 Lincoln Park, Canmore) at 8:00am on the day of the program. Your instructors will be ACMG certified guides. Minimum of 5 participants. To keep prices down participants are responsible for their own transport to Canmore and during the program. Canmore is a 1 hour (100km) drive west from Calgary. If you are flying from afar for the program we suggest that you rent a car for your visit. In addition to getting you to the climbing locations it will allow you to explore our region afterwards. These are not included in the course fees. There are lots of options available including campgrounds, hostels, B’n’Bs, motels and hotels. We would be happy to make arrangements for you. Food is not supplied. Bring plenty to drink and a lunch plus energy snacks. The course fee includes use of topo maps. You need to bring outdoor clothing and footwear suitable for hiking around in all conditions. The field element will be delivered close to the vehicles. We suggest bringing warm clothing of varying thicknesses that can be ‘layered’ to achieve comfort and versatility, depending on the time of year. The most important consideration for clothing is the ability to regulate temperature whilst moving around on this program. Please book as early as practical to avoid disappointment. We require full payment at the time of booking. Please read the attached information on booking conditions and cancellation penalties carefully before booking. For all your travel insurance requirements we recommend the Simpson Group. This agency offers a wide range of travel insurance options including Trip Cancellation/Interruption, Travel Medical and Personal Effect Loss for Canadian Travelers. We highly recommend purchasing this insurance. For more information and to purchase a plan, visit the Simpson Group’s website.